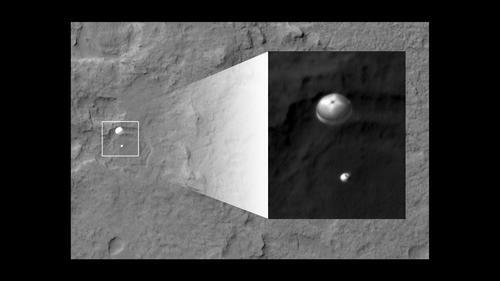 The image was taken while MRO was 211 miles (340 kilometers) away from the parachuting rover. Curiosity and its rocket-propelled backpack, contained within the conical-shaped back shell, had yet to be deployed. At the time, Curiosity was about two miles (three kilometers) above the Martian surface. "Guess you could consider us the closest thing to paparazzi on Mars," said Milkovich. "We definitely caught NASA's newest celebrity in the act." Curiosity, NASA's latest contribution to the Martian landscape, landed at 10:32 p.m. Aug. 5, PDT, (1:32 on Aug. 6, EDT) near the foot of a mountain three miles tall inside Gale Crater, 96 miles in diameter. In other Curiosity news, one part of the rover team at the JPL continues to analyze the data from last night's landing while another continues to prepare the one-ton mobile laboratory for its future explorations of Gale Crater. One key assignment given to Curiosity for its first full day on Mars is to raise its high-gain antenna. Using this antenna will increase the data rate at which the rover can communicate directly with Earth. The mission will use relays to orbiters as the primary method for sending data home, because that method is much more energy-efficient for the rover. Curiosity carries 10 science instruments with a total mass 15 times as large as the science payloads on the Mars rovers Spirit and Opportunity. Some of the tools are the first of their kind on Mars, such as a laser-firing instrument for checking rocks' elemental composition from a distance. Later in the mission, the rover will use a drill and scoop at the end of its robotic arm to gather soil and powdered samples of rock interiors, then sieve and parcel out these samples into analytical laboratory instruments inside the rover. To handle this science toolkit, Curiosity is twice as long and five times as heavy as Spirit or Opportunity. The Gale Crater landing site places the rover within driving distance to layers of the crater's interior mountain. Observations from orbit have identified clay and sulfate minerals in the lower layers, indicating a wet history. The mission is managed by JPL for NASA's Science Mission Directorate in Washington. The rover was designed, developed and assembled at JPL. For more about the Mars Reconnaissance Orbiter, see http://www.nasa.gov/mro .